Welcome to the Seaside Piecemakers website. Explore the site to learn more about the educational and social programs our guild offers. We meet at Trinity Wellsprings Church in Satellite Beach. The address is 638 S. Patrick Drive, Satellite Beach, FL 32937. Please spread the word. Calling all Seaside Military Vets! We will be honoring all of our Seaside members who served in the military during our May birthday celebration. Please sign up at the Hospitality table during the April meeting so that we may recognize you and thank you for your service. 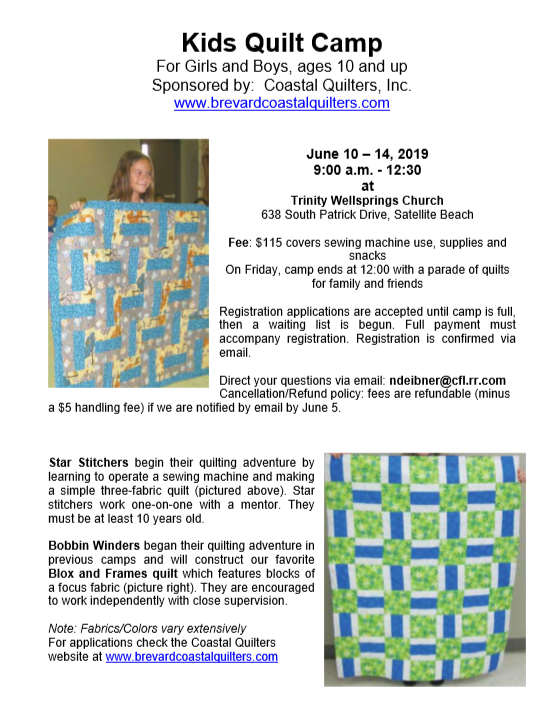 Many of our members are participating in Kids Quilt Camp. It’s another great way to get involved, meet new friends, and support the community! Check with Coastal Quilters to see how you can help. A new slate of officers will be voted on at the April meeting. Please check your Chatter for more information. Non-members are welcome to attend up to three general meetings per year. Please check our calendar and note that a $10 fee is charged when the program scheduled is a national teacher. We look forward to seeing you! Download Check Request form for end of year reporting. Applying to become a member.